Of a greenish pale and brilliant color. It´s aromas are fresh and faithful to its variety, reminding us to fresh tropical fruits, flowers, pear, grapefruit and green apple. The mouthfeel is very long, confirms the aromas, especially citric and green apple, keeping a well-balanced high acidity. Pairing It's a very versatility wine to pair with food. Ideal at low temperature and accompanying preparations with high minerality like oysters, ceviche, many Japanese dishes and Greek salad. The name of this wine was inspired by Isidora Goyenechea , the nineteenth century entrepreneur who revolutionized the wine industry in Chile. 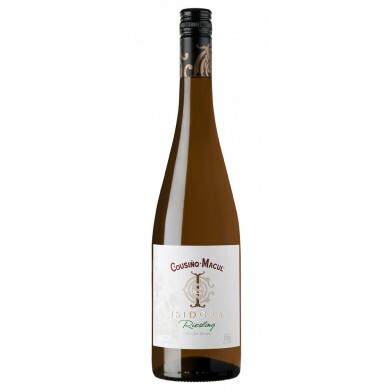 Riesling cuttings were brought from Germany and have managed to develop in the Maipo Valley with a distinctive personality. The climate during season 2015-2016 was not usual comparing it with past years. The main effects were over the health of the grapes due to strong showers during April; a delay in the ripening period due to a cold spring; and lower general yield due to both conditions. All our wines are expected to develop very well ending up fresh and with good natural acidity. In the case of whites, they will show lower alcohol levels. In the case of reds, they will be elegant with flower notes and fruity. In general, we´ll get lower yields but high quality wines, representatives of the climate conditions, origin and variety. The grapes were hand-picked and selected in the cellar. Then the complete bunch was pressed and we obtained the juice that was decanted in cold for 36 hours. The clean juice was inoculated with selected yeasts to potentiate the floral and fruity character of the variety, as well as to favor a slow fermentation in small stainless steel barrels at a temperature between 12 and 13ºC (54-55ºF). The wine matured during 4 months, it was then clarified, stabilized in cold and underwent a small filtering before bottling.